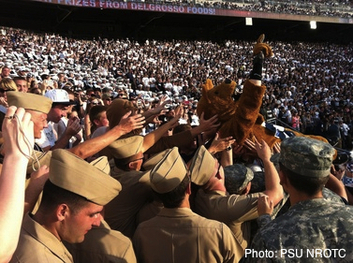 Penn State NROTC boasts one of the largest Midshipman Battalions in the country. All Battalion activities are organized by students, who are a part of an organizational hierarchy that simulates shipboard organization. NROTC Battalion members are also heavily involved in all aspects of student life. Many take part in Penn State’s large Greek community and its thriving intramural sports scene, as well as the IFC/Panhellenic Dance MaraTHON, the largest student philanthropy in the world. Penn State, as one of the largest universities in the US, offers something for everyone, and NROTC Battalion members fully take advantage of the diverse opportunities available here. The button above will take you to the Penn State ANGEL site. You will need a Penn State ID and password to sign in.